Help students make their thinking visible with Google Docs and screencasting. Read. Answer comprehension questions. Repeat. Right? Not anymore! The move to Common Core with a greater emphasis on students interacting with nonfiction texts has challenged many teachers to think of transformative ways to teach reading strategies for connecting and comprehending. Many times the way to find out how well a student comprehends a text is to have him or her read it and then answer comprehension questions or write a summary. These tasks have moved from paper and pencil to computer, but they remain largely the same. Is there any way to transform them to elicit greater learning and interaction? Yes. I have been happily experimenting with the think-aloud concept in my high school English classes, and I'm pleased with the results. I provide students with an article on a Google Doc and teach them how to digitally annotate it as they read, employing specific reading strategies. 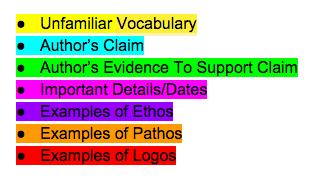 It's helpful to provide them with a color-coded legend to follow as they mark up the text. Currently we are working on expository reading strategies, so a legend might look like the one below. As students read, they use the comment function on the Google Doc to respond. For example, a student reads a section of the article and, using the Content/Purpose strategy, writes one comment that summarizes that section. Underneath that, the student writes a comment that describes the author's purpose. Teachers can specify which strategies students should use, and after students have extended experience with them, you can offer them a choice of strategies. Gradually allowing choice helps students acquire vital metacognition as they get to know which strategies assist them most. The teacher models this strategy as a whole-class direct-instruction lesson, offering a "think-aloud" as he or she works through the text. The teacher offers an article for all students to read silently, with directions to annotate using specific strategies. As a class, students "think aloud" as the teacher digitally annotates the article projected for everyone to see. When students are ready to dive in themselves, it's ideal to have them work on the Google Doc in pairs. The conversation that occurs during this collaborative reading is helpful in cementing these strategies into regular practice. Students teach and coach each other as they go along. When students are ready to take this concept to the next level, direct them to use Screencastify or another screencasting tool to create their own "think-aloud" videos of articles they've digitally annotated. Students should be encouraged to use the academic language acquired while learning the reading strategies. This is where they have an opportunity to explain their annotations and the observations they made about the author's argument and craft. The screencast think-aloud creates a rare glimpse into the minds of students and what happens internally as they read and work to unpack the meaning of text. Usually after reading, annotating, and thinking aloud, students share their think-aloud videos on their blogs and give feedback to peers. A student's example screencast with accompanying blog post explains how the annotation and screencast process assisted the student in making sense of the article. With meaning from the article neatly unpacked, students are ready to write their expository essays, taking a position on the topic. They tell me they feel more confident in their writing after spending that quality time annotating and thinking aloud to process their reading. For more information, please email [email protected] or connect with me on Twitter @mlsnyder92. "2011: What I Read" by erin m used under a CC BY-NC 2.0 license.